Based on a work at academiaprisca.org. 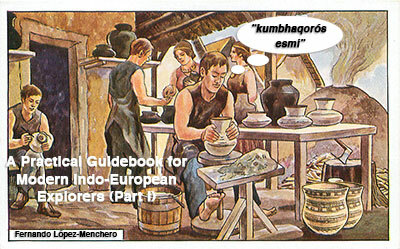 A Guidebook for Modern Indo-European Explorers is a self-learning course divided into fun lessons carefully designed to introduce the reader to the difficult aspects of the Proto-Indo-European grammar, while offering at the same time interesting notes of culture and language usage. After each six lessons there is a recapitulation of the most important achievements, which presupposes the daily study of one lesson. Each lesson offers thus many examples of few selected grammatical keystones, always built around a common theme that lightens the effort of language acquisition, be it scenes of everyday life, a fairy tale, social events, or formal religious texts. It is the best resource to date to learn Late Proto-Indo-European, from the most basic level up to an intermediate level (estimated B1–B2, depending on the previous background in IE and classical languages). vocabulary used in the lessons, with relevant grammatical information, and lessons where they appear in the text. tables with verbal morphology and conjugated examples. tables with nominal morphology and inflected examples. Please note: This is not a professionally (or otherwise carefully) curated printed edition. It has a more or less informally structured layout, intended to facilitate its immediate publication for its practical use by interested learners, and to receive corrections and proposals for improvement, until the whole self-learning book can be published with a more professional design. Because of that, there are some sections (like vocabulary and grammatical tables, directly linked to Excel spreadsheets for ease of use) that might look more like a working project than a printed book. There is no simple way to publish certain resources soon and do it with a professional look. Compressed ZIP file with all spreadsheets for download. Compressed RAR file with all spreadsheets for download. Compressed 7z file with all spreadsheets for download. We would like our main works to be as accurate as possible, and to be translated into all possible languages, so that everyone is able to read it and learn MIE in their mother tongue. If you are interested in translating the text, please contact us first to see if there are other people already working on it. For the moment, this self-learning method is being translated into French (to be published very soon) and German. 23 NOV 2018:: (v. 1.02) minor errors and stylistic details. 22 NOV 2018:: (v. 1.01) ‘sentí’ (auto-corrected in Word) changed for the correct ‘senti’; added info on cover image.